Fraud and other forms of theft are an unfortunate reality in today’s business world. If you suspect that your business may be the victim of fraud, you need to immediately have it investigated by a qualified expert. The CFE designation is bestowed by the Association of Certified Fraud Examiners. The CFE credential denotes proven expertise in fraud investigations to uncover the sources, pathways, and full extent of business fraud during a fraud investigation. Brady Ware’s CFEs have the experience and insight necessary to uncover financial discrepancies in your business no matter how hard the fraud perpetrator may try to hide them. We effectively identify the relevant financial considerations, quantifies the issues, and present those findings in clear and effective reports and exhibits. This documentation can support insurance claims and legal proceedings. Our CFEs can also serve as an expert witness when necessary. 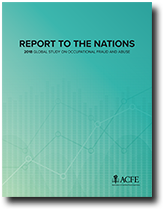 The annual ACFE Report to the Nations on Occupational Fraud and Abuse provides an analysis of 2,690 cases of occupational fraud that occurred in 125 countries across 23 major industries. Our internal controls consulting service examines treasury processes within an organization dealing with controls over cash receipts, cash disbursements, and payroll, as well as credit cards and online banking controls. In the ACFE 2018 Report to the Nations on Occupation Fraud and Abuse, over 89% of the cases in the study were related to asset misappropriation, and the majority of fraud activity our experts have investigated are related directly to asset misappropriation. Many employers place trusted employees in charge of the finances at their companies with little to no oversight. Brady Ware’s fraud experts highlight where weaknesses exist in your company’s internal controls and offer practical ways that your company can improve controls. We encourage employers to trust but to also verify. Our goal is to give owners a peace of mind that control weaknesses have been addressed and allow you to sleep better at night knowing we’re watching out for your financial interests. You’re not alone if you have discovered potential fraud in your business. But you don’t have to investigate it alone. Brady Ware stands ready to dig as deeply as needed to uncover the details and evidence of business fraud.